Republic Square will be an active, urban green space grounded in rich history that traces back to the birth of our city. 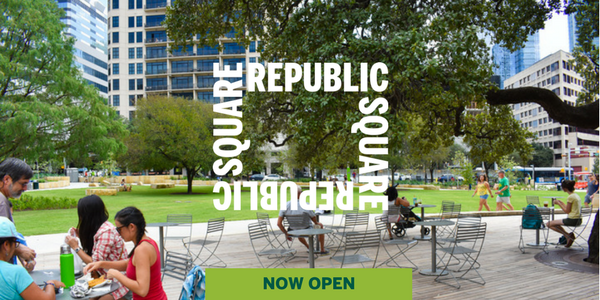 The newly renovated square will be a place unlike any other in Austin with daily programming, modern amenities, and a full-service cafe. Your support will help us to keep the park activities free for everyone to enjoy. All donations made to Republic Square help fund free programming and educational opportunities that showcase the cultures and talents that Austin has to offer to those who live and visit here. Thank you for your generous support of Republic Square.